Ten-man Luton slumped to the biggest defeat at home under manager Nathan Jones as they were comprehensively beaten by Swindon Town this afternoon. The game hinged on a decision just after the half hour mark when Luke Norris rose to head a cross back across goal, with Hatters defender Scott Cuthbert pulling back former Barton Rovers striker Keshi Anderson in the area as he went to score. Referee Graham Salisbury brandished the Luton skipper a straight red and this time keeper Marek Stech couldn't provide the heroics, sent the wrong way by Norris's confident strike. Hatters had not been the out and out dominant force before the incident, but certainly appeared the more likely of the two sides to score, however, once they fell behind, there was only one winner. Two further goals in the second period confirmed the fact, as Luton's heads dropped badly, almost willing the final whistle to be blown in the final 20 minutes. Hatters boss Nathan Jones made two changes to his side, as Andrew Shinnie and Olly Lee back in, with the hosts reverting to their diamond formation, Glen Rea and Luke Berry dropping to the bench. It was the recalled Lee who should really have opened the scoring on six minutes, arriving perfectly to meet Jack Stacey's cross, only to tamely volley straight at keeper Lawrence Vigouroux. Town then opened up the visitors on the left, Shinnie spotting Dan Potts's run and from his low cross, Danny Hylton diverted wide. Swindon's only attempt from the first 20 minutes saw Olly Lancashire head a free kick narrowly wide from a decent position, as they looked to make use of Chris Hussey's dangerous delivery whenever possible..
Potts then wasted a glorious chance just before the half hour, as after making a superb run to meet Stacey's inviting cross, couldn't keep his composure at the crucial moment, volleying over. 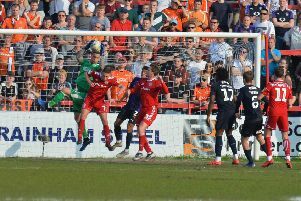 However, out of nothing, Swindon had the lead on 32 minutes, Norris making no mistake from the spot, as Luton conceded the first goal for the fourth time this season. Boss Jones reacted by bringing on Rea for Shinnie as Luton had strong penalty shouts of their own moments later, James Collins tumbling in the area, only for Salisbury to keep his arm by his side this time. Luton made another switch for the second period, Harry Cornick replacing Lee and although he appeared to add some pep early on, Town were left facing a mountain to climb on 51 minutes. True, there was no questioning the quality of Hussey's strike, curling beyond Stech with the outside of his boot from just inside the area, but the ease at which he strolled into that position was criminal, with Cornick letting him go and Town's defence just standing off and standing off. It went from bad to worse for the hosts on 62 minutes as they were cut open once more, as although Sheehan was left complaining of a foul in the build-up, play went on, with Norris reaching the byline and cutting back for Paul Mullin to hammer past the exposed Stech. Town were never really going to get back into it, and the worry was Swindon might rack up a cricket score, but fortunately that didn't materialise. Berry replaced Hylton, with his free kick causing little problems for Vigouroux, with the underworked Robins stopper also parrying Sheehan's set-piece away, but Town's fight had gone as had a fair few home supporters by the time the whistle finally went. Subs not used: James Shea, James Justin, Luke Gambin, Elliot Lee. Robins: Lawrence Vigouroux, Ben Purkiss, Chris Hussey, Olly Lancashire (C), Paul Mullin, James Dunne, Luke Norris (Matt Taylor 64), Timi Elsnik, Kayne Woolery (Amine Linganzi 85), Dion Contory, Keshi Anderson (Kellan Gordon 81). Subs not used: Chris Roberton, James Brophy, Harry Smith, Reice Charles-Cook. Booked: Collins 34, Sheehan 40, Potts 67.